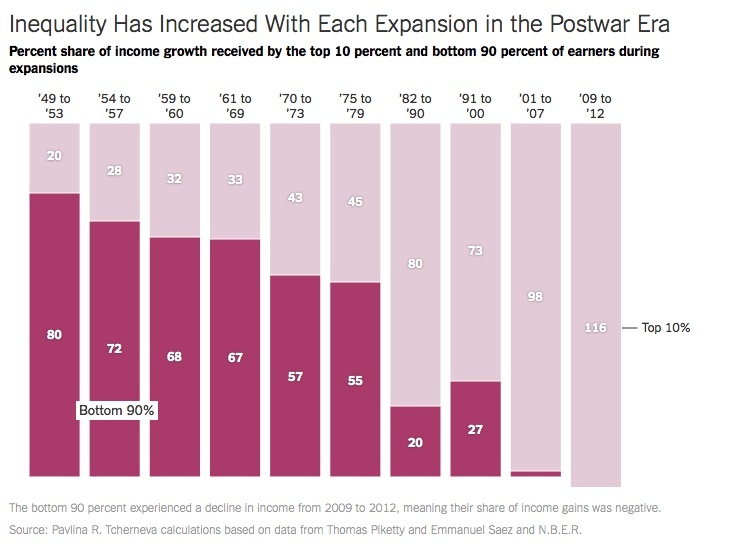 The rich get richer and poor get poorer. What, if anything, are we going to do about it? With each passing day, it seems as if the rich get richer, the poor get poorer and while our economy expands, the divide between rich and poor gets wider and wider. Sound like an exaggeration? Perhaps not. Read Neil Irwin’s article in this past weekend’s NY Times, “The Benefits of Economic Expansions Are Increasingly Going to the Richest Americans”. Irwin cites data compiled by Pavlina R. Tcherneva, an economist at Bard College to prove this disturbing trend, although none of this should be a surprise. Two charts in the article tell the story well. The first (below) shows the share of income growth received by the top 10 percent and bottom 90 percent of earners during periods of economic expansion. I grew up in the 1950’s and 1960’s, began my work career in the 1970’s and reached a modicum of business success in the 1980’s and 1990’s. My father was a doctor. We went on family vacations when I was little. I went to good schools and ultimately raised a family and owned my own business. I wanted for nothing. Life was and still is good. As a child and teen growing up in inner city Detroit, it always seemed like the auto factories were humming, the shops were full and growth in prosperity, while not perfect, was being shared. According to I.R.S. data, I’ve been among the 10% who’ve benefited from expansions for many years. Yet, it doesn’t take much other than a look at the daily papers or a walk around any American city to see that something doesn’t seem quite right. Shoppers seem well-heeled, coiffed and comfortable among my top tier peers. But why, I wonder, when I walk into Home Depot, Walmart or the local supermarket, I rarely see exuberant shoppers from lower and middle classes? You may think it’s the stores I shop in only cater to my types but I travel and like to walk around and check in on the retail scene to get a flavor of the local zeitgeist. 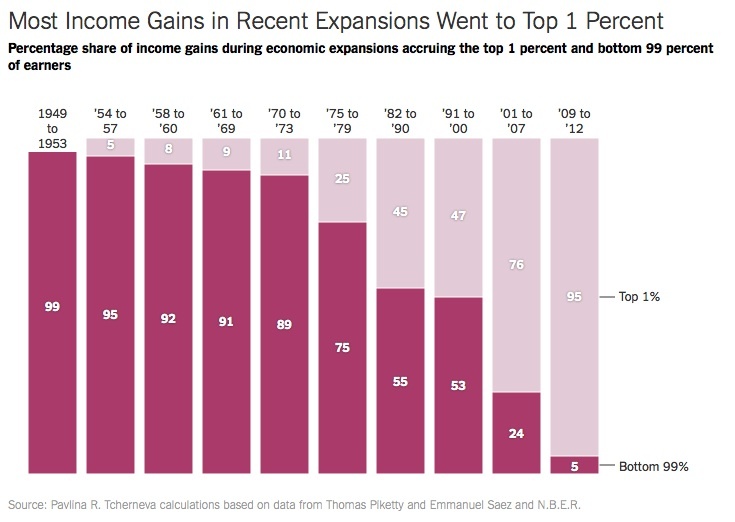 The second chart from the article (below) shows the share of income gains during expansionary periods that went to the top 1 percent versus bottom 99 percent. The trend in wealth gains becomes even more striking. Before I saw these charts. I always thought things seemed to change for the worse in the 1980’s. That was when the idea of “trickle down economics” came into vogue and was put into practice. The idea was that if we cut taxes for the well-off, the additional amount they gain will “trickle down” to the middle and lower classes. But I always wondered how that could be. After all, I could only buy one car every few years, one boat, one house, etc., nothing like what hundreds, thousands or millions of people making less than me could do if they had the money. So how could the benefits that I and my fellow 10 percenters (alas, I’ve never made it into the top 1%) really make a difference in the prosperity of all. The answer as we can see from the data is that they couldn’t and haven’t. Our Congress can’t seem to do anything constructive to pass sensible solutions and our President can’t persuade them to because one party thinks it’s its job is to undermine his term. And we go to the polls and re-elect the same clowns who can’t interpret the data, read the charts or come up with any compromise that might try something different to help. In 1811, a smart guy named Joseph de Maistre, wrote “Every country has the government it deserves.” We often think that quote was intended for our “exceptional” America. It was actually directed toward Russia, a country, then and now, of rich oligarchs separated from the lower classes by their profligate wealth. Sound familiar?